The title of this blog was inspired by an essay of the same name by Zenos Hawkinson, the longtime history professor at North Park College and brother of my good friend, Rev. Jim Hawkinson, who died May 2011 at age 80. 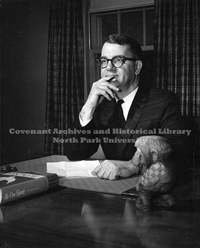 The essay appeared in Amicus Dei, a Festschrift honoring Covenant historian and former North Park president Karl A. Olsson, who figures prominently in my research on Pietist models of Christian higher education. Hawkinson put Olsson and his mentor, NP founder David Nyvall, in a line of Pietist educators stretching back to August Hermann Francke, the German Pietist leader who played such a pivotal role in the early development of the University of Halle. …the Pietist schoolman as a type necessarily reflected the character of Pietism as a Christian movement. The Pietist schoolman was usually a university graduate profoundly discontent with the state of the church and determined to see it reformed. He was mainline in theological conviction but hungry and thirsty for living faith experienced in the company of others. He tended to place less emphasis on creed than on Bible, less on erudition than on pastoral care, less on the authority than on the responsibility of the pastoral office. The Pietist schoolman was urgent about his responsibility to the children of common people. Francke loved to say that his duty was twofold: God’s glory and neighbor’s good. How might the Christian college serve to renew the Church? What if a Christian learning community cohered less around a bounded set of doctrines and more around the shared experience of conversion to Christ (what Olsson called “convertive piety”)? What are the pastoral responsibilities of a professor at a Christian college? How can teaching, say, European and international history glorify God and do my neighbor good?